Some of the splendor of an alpine meadow or mountain slope in spring may be experienced by visiting the spectacular annual Spring Show of the Vancouver Rock and Alpine Garden Society. The hundreds of entries in this show extend over a broad botanical range, beautiful plants which are very often challenging to grow and rare to find. 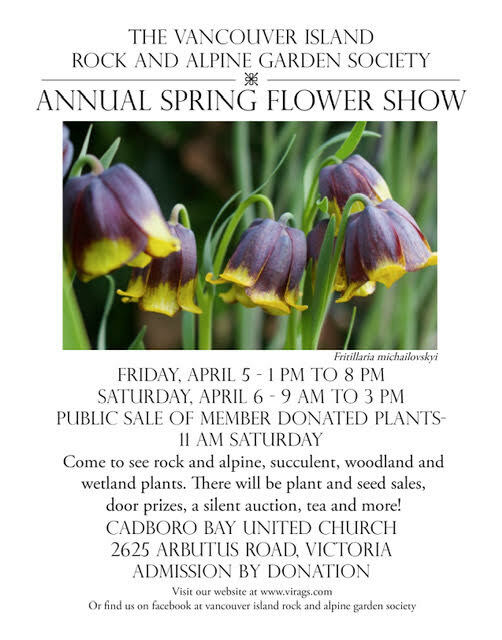 The 2019 Show will be held at Cadboro Bay United Church, 2625 Arbutus Road, Victoria, BC on Friday, April 5 from 1 pm to 8 pm and on Saturday, April 6 from 9 am to 3 pm. As well as show entries to enjoy, there will be plant and seed sales, displays, door prizes, and refreshments. The sale of club-grown plants will begin at 11:00 am Saturday. Admission is by donation.